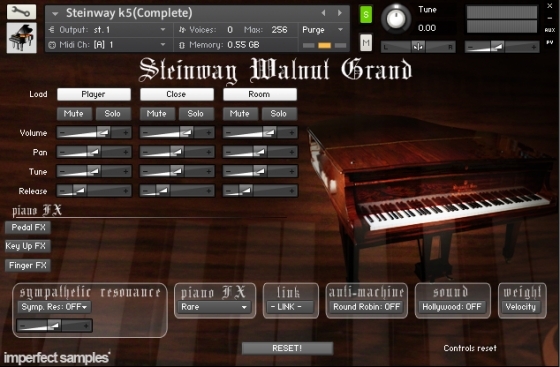 The Steinway Walnut Grand Piano (pro) contains two mic perspectives. With 15 velocity layers of mic perspective 1, and 12 velocity layers of perspective 2, along with piano FX, sympathetic resonance, and true staccato articulations in both perspectives, the Steinway Walnut Concert Grand (pro) has more versatility than the (basic) package. Imperfect Samples Brasted Broken Upright Piano sample library is an out of tune honky tonk to the extreme. The Brasted Broken Upright Piano was sitting in an old house gathering dust for over 90 years. This upright piano is suitable for situations where an extremely intimate, and unusual piano sound is required.